All media inquiries can be made by contacting Haley Figurski, Media Relations and Marketing Manager, at 814-871-5481. 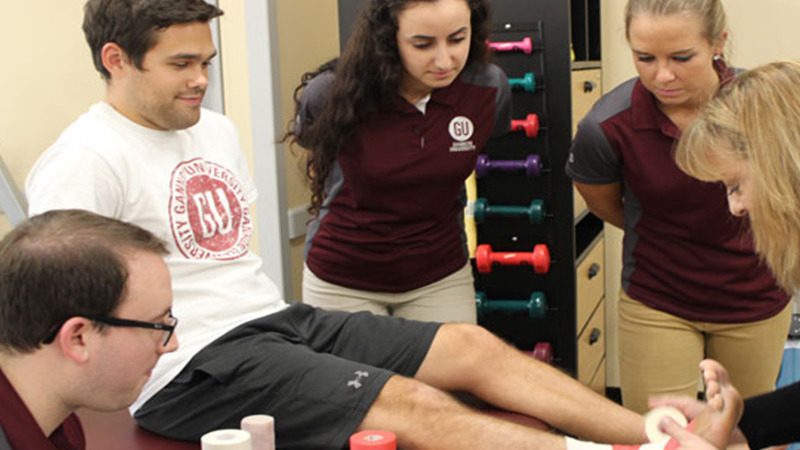 The Gannon University-Ruskin Master of Athletic Training program has received accreditation by the Commission on Accreditation of Athletic Training Education (CAATE). The program has received the maximum initial accreditation for the period of five years. The CAATE accreditation process offers a means of providing assurance to the public that a program meets specific quality standards. The process helps to maintain program quality and stimulates program improvement through program assessment. Graduates of the athletic training program are eligible to sit for the national board exam before applying for state licensure. Athletic trainers who hold a state license are then qualified to practice under the direction of a physician. "Our new accreditation in athletic training is a testament to the Morosky College of Health Professions and Sciences mission to deliver exceptional academic programs that prepare students to become knowledgeable, innovative, and socially responsible professionals within their careers and communities," said Sarah Ewing, dean of the College of Health Professions and Sciences. "Accreditation by CAATE acknowledges the quality of education our program offers to students interested in pursuing a career in athletic training and affirms our commitment and ability to develop highly skilled and competent athletic trainers prepared to deliver evidence-based clinical care to their future patients."